Sometimes the dreams that come true are the dreams we never thought we had, or the dreams we had forgotten. I think our subconscious sometimes takes over and leads us down the right, and in my case, muddy path. Bonjour Médoc! Back to food, I went to the fish market last Saturday and explored the crustacean world. I am the type who loves talking to everyone (something I picked up from my father) and I can start conversations out of the blue with just about anyone, as long as it’s about food. I also have a ‘food sense’ which allows me to smell out fellow foodies. My neighbor in the queue looked like a fellow food lover, her gaze so enthusiastic and precise, she was looking at squid with such happiness and anticipation, just like a child in a candy store. We chatted about her lunch recipe, squid in a cocotte, with lemon juice, wine and olive oil, and the obligatoire garlic of course. She fell for the squid, I fell for the mussels, it was love at first sight. They were glistening black, with a hint of electric blue when the light hit them in a certain way. How could I resist them, such vivid yellow meatiness, such promise. I associate mussels with two places, forever stored in my food memory. ‘Les Vapeurs’ in Trouville for some delicious moules marinières (and à la crème! ), and ‘Chez Hortense’ in Cap Ferret, about an hour away from where we live in Médoc. After much deliberation I chose to cook mussels inspired by ‘Chez Hortense’, a restaurant we love to visit in the summer for some finger licking good mussels and an exquisite view of the dune of Pyla. Imagine mussels cooked with Bayonne ham, sausage meat, garlic, shallots, breadcrumbs, white wine, parsley. Most of my favourite ingredients combined with little gems of the sea. Irresistible. Served with fries or a great baguette, or both, to soak up the beautiful sauce. I came back home with more than 5 kilos (the five I asked for plus the ones they threw in as a bonus), half of them went straight into my book, the rest I cooked for my family. Talking of family, let me tell you about Þórir (Thorir). He’s my 16-year-old stepson and he’s the hungriest boy I ever met. Stick-thin and handsome he’s ever worrying if we will have enough food. Usually I boil about 750 grams of pasta, he’d rather I would do a kilo. In fact he makes sure I do. Last night, we had pizza night which my husband always turns into competitions with sore losers and gloating winners. Thorir was more worried about getting enough than winning the prize. “Is it two pizzas per person?” he asked with a hopeful look. These are big pizzas by the way. On Saturday he volunteered to help me with the mussels, probably because he thought I was being slow, he did a pretty good job at cooking and even better job of eating the spoils. Watching him sitting there in the glorious sunshine, blissfully working his way through what seemed like a mountain of mussels, reminded me of myself and of my father. I guess when it comes to food, all of us food-obsessed people are kindred spirits. 1) Clean the mussels under cold running water. Place them in a large pot, add white wine and a dash of black pepper. Cover and cook on a high heat for 5 minutes approx, or until mussels are open. Drain and set aside in a large bowl, reserving a few ladles of the liquid in another bowl. 2) In the same pot, melt the butter on a low heat and fry the shallots and garlic until golden. Set aside. In the same pot, add more butter and fry the sausage meat and Bayonne ham on a medium heat until golden. To avoid lumps, use a fork and press to crumble. 3) At the same time, heat one to two tablespoon of olive oil in a pan and fry the breadcrumbs until golden and slightly crunchy. Set aside. 4) Return the mussels to the pot. Mix all the ingredients together making sure that the sausage meat/Bayonne ham/garlic mixture coat the mussels. You can add a ladle of mussel cooking liquid if you wish. Add the fried breadcrumbs and parsley, mix well. Serve immediately with French fries on the side. To add a sweet touch to this exciting meal, I craved the tasty Traou Mad, little salted buttery biscuits, sort of like the French version of shortbread, originally from Britanny. They are rich, no wonder Traou mad means ‘good things’ in Breton. I improvised the recipe, adding a dash of honey (just like my madeleines), using a muffin pan so they don’t lose shape and an egg cup to press them. It’s all about improvisation! In a large bowl, combine the flour, baking powder and salt. Make a well in the center and add the butter (save a tbsp of butter to brush the cookies), egg yolks, sugar and honey. Mix until you get a good dough. Place dough on a cling film and roll into a sausage shape approx 5 cm/ 2 inches approx wide. Place in the refrigerator for about 4 hours. Slice the dough 1 cm thick and place in a muffin pan (so they don’t lose shape) – they usually have 6-8 moulds). Bake in a preheated oven 180°C/ 350 F for 10-12 minutes until golden (depending on oven strength), 5 minutes before the end, take the pan out, brush the cookies with melted butter and use the base of a standard eggcup to press them. (This last step/pressing is optional). love your blog…beautiful photos and beautiful foods. Your blog, your recipes are amazing! I can’t wait for your book!!! So perfect !! Ha it’s an adventure with the 15 year old at the moment let me tell you 🙂 No, all good. There are parts of the south coast that are just as they were before Europeans arrived. Absolutely pristine. A very special part of the world if you appreciate wild places and solitude. I should do a post about it but then I’d have to kill anyone who read it. Joking! Beautiful sentiment about food kindred spirits. Your blog is always a delight to visit……now I have it that it pops into my ‘inbox’ so I don’t miss a post…..love it!!!! Oh I am green with envy about the mussels. I found some in my supermarket and they were all dead! and no one seemed to care. Will await the book with joy! hinged shell as a pincher. A book! Will look forward to that . I am so pleased to hear you are writing a book. I have tried many of your recipes thus far and each one has been perfect, without fail. The tied lamb shoulder was divine! I have made it several times. I will be trying your mussels soon. Your blog contains all that warms my heart. Good food, dogs, outstanding photography and of course France. We usually stay in le paradou and cook to our hearts content. Your region is stunning! Cant wait for your book to arrive! Pre order. Amazon! I’ve never been a big fan of mussels but I think that’s because I’ve never really known how to prepare them. I’m excited to try it your way! I do know that I will for sure try the butter cookies. I am so looking forward to your book, although I wish it were being released much sooner. 🙂 I’m sure it’s a lot of hard work and will be worth the wait. Is your husband taking the photos for it? and I was wondering…have you ever shown a full picture of your kitchen? I would love to see and how it works for you cooking so much in it. Great photos as usual, thanks for sharing. I’m so happy that you’ll be putting your lovely recipes into a book! Yours is the kind of blog that I would love to read while sitting snuggled on my sofa with a good cup of tea, in other words, it needs to be in book form…Once I have your book, that is what will happen, and I am soo looking forward to it. Soooooo excited about your upcoming book!!! These mussels sound delicious! I set aside your blog to look at when everything around me is quiet and calm as I just want to enjoy and be “in” the wonderful environment you have created. I can smell the garlic, envision the salty taste of the mussels and feel the crunch of the honey-butter cookies with the juicy peaches. You have the hearts of all of us Foodies out here. I love you blog, it is always so inspiring! Where did you find your silverware? It is quite pretty. You have inspired me to be a mother that can cook some very delicious meals for my family! As for your new book… what glorious news! I can’t wait to get a hold of your recipes! Will it also be printed in US metric system and available in the US? I am terrible with my conversions. I love your blog, and dream to one day explore the countryside of France. I’ve always wanted to go to Paris, but your photos in the country and with all the local people and places are so much more desirable. This was heartwarming, Mimi. My deepest wish is that my boys will still cook with me through their teen years. They currently adore getting in the kitchen together and we’re making memories. I was just speaking of you today in a car with a friend as we ran around to the antique shops.I was telling her you are writing a cookbook and how I prayed it would be in English!YOU answered my prayers just now!New York means ENGLISH!!!!!! !Can you share a few of your favorite cookbooks with me?I think I know one or two already!I must go see if they are published by the same. You areNOT going to believe this!I have the SOPHIA book and she signed it for me!!!! !She hangs out in my area with a friend of mine!Anyway,I donot know the other books you speak of except MFK Fisher as she is a classic………again i think she lived her final years close to me in SONOMA!The cookbooks I thought you might mention are by TESSA KIROS she has a few out I think three.Beautiful books……..photography etc…..curious if you know them. You adore SOPHIA cause YOU could be her daughter!Your both STUNNING!As far as calling me CONTESSA……..well I love it!I’m just a” want a be Contessa”,so have given myself that name……so people “get me”others roll their eyes!Life is short lets have fun!!!!!!! !AND COOK!!!!!!!!! children in the kitchen… always brings a sparkle and twist to a dish, a new taste to be born. I look forward to each of your posts, it brings a sprinkle of inspiration into my daily kitchen – keep up the beauty in the everydayness! Lovely story Mimi and congratulations on the book. I will have to send you my recipe for pecan, brown sugar shortbread. Making a huge batch today,they disappear very quickly. I think I am definitely going to have to try those cookies! I have a lovely orange blossom honey that I think would be perfect for this! Looking forward to your book! I, too, am curious if your husband will also be shooting the pics for it as well! AND, I second the person who mentioned they would love to see pics of your entire kitchen . . . well, if I were going to be totally honest, I’d love to see your entire house! The little glimpses we are privileged to see are sooooo tantalizing! 🙂 Thank you for such a lovely escape your blog provides from the day to day! I agree our subconscious minds are so powerful. Coyly hidden intentions break free sooner or later. Happy muddy trails! I hope to put on some boots soon and hit the dirt with home grown foods. Real food in this country is a headed down a slippery slope! Bonjour! Lovely recipes, as always from Manger. Including a great tip for shaping cookies. I think we all look forward to your book. Although this blog is a wonderfully illustrated book of amazing food and interesting stories in itself. Beautiful post. Reminds me that I must get some mussels. Ours are from the Anse d’Aiguillon, and I think the moules de bouchot from there are hard to beat. I cook mine with absolutely nothing…just put them in a pan with the lid on over heat for about 5 mins. Beautiful post (in words and pictures) – as always. I am really looking forward to your book! What a great post! I absolutely love your site, beautiful photography, and inspiring recipes. I have turned many friends and family onto your blog and we all look forward to your cookbook release. Thank you for sharing your love of food and France! MImi, congratulations on your book! I can’t wait to see it. Oh I love mussels and yours look divine, yum! Oh, Mimi… Don’t ask… My sweet little Jakob is at the hospital the seventh week now. But life pushes us forward and we are looking forward to the day he will be home again… Many greetings to you all! Thank you very much, Mimi! I will tell him… Have a lovely week-end! The muffin tin/egg cup technique is crazy clever of you! And congratulations on the book – will no doubt be gorgeous and practical. Thank you very much for your beautiful blog which keeps me patient until your cookbook comes out in fall 2014. Thank you for working so hard at it, can’t wait. 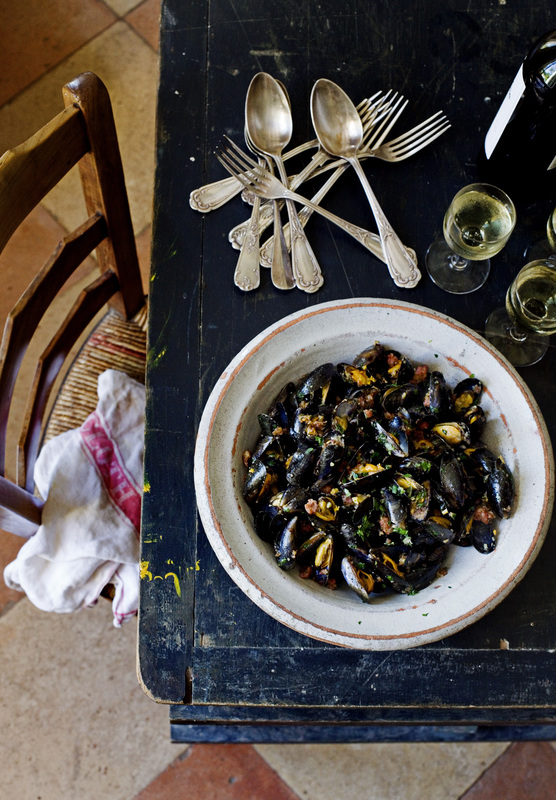 wonderful,i love mussels and i must try that recipe,and i cant wait till your book comes out. Congratulations on the book, Mimi! I love hearing stories of dreams coming true. I have a few of my own and am still patiently and sometimes impatiently waiting. 🙂 By the way, I love how serene you look while cooking, I look like a mad woman! Mimi, comment pouvez-vous cuisiner des produits du terroir français, habiter l’une des plus belles régions et sortir un livre de recettes…en anglais ? Puis-je garder l’espoir d’une sortie simultanée en français? Oh une émission de cuisine ? Quelle belle nouvelle ! Merci pour la petite info en exclusivité, je pense que vous n’avez pas encore le dire d’en dire plus (à moins que? 🙂 ) tenez-nous au courant, j’attends cela avec beaucoup d’impatience !! Je vous envoie un peu de soleil du Béarn, le temps est plutôt lunatique aujourd’hui ! Whenever I first stumbled upon your site about a year ago, I knew you would come out with a lovely cookbook. Your style is effortless. Your charm, evident. And your cooking, passionate. Congratulations on your book and all of the other ventures that come along with that blessing! Thank you for letting us into your the world of Médoc! Of course, darlin’! This dessert reminds me of my first cup of coffee as a young girl. It’s smoky and sweet! Perfect ending to a lovely summer day. Enjoy! These mussels look absolutely delicious, I love the combination of ham and pork to make this a hearty dish. Such wonderful news about your cookbook and that dream that you had many years ago in Paris has come true! Looking forward to fall 2014. Congrats on the cookbook, Mimi! How exciting! Looking forward to it — I’m sure it will be filled with beautiful French fare! I would love to read more stories about your father. He sounds like a true food lover and quite a character! Can’t wait to salivate over the delicious dishes in your book Mimi! I know it’s a lot of hard work, but the end result will be spectacular. I remember you did a TV interview a while ago, is it available to view on the internet? Mimi, I am so excited for you! I collect cookbooks and can not wait to enjoy your recipes. I would love to see a holiday chapter. Perhaps special recipes you and your family enjoy for birthday dinners or holiday meals. Hope you are celebrating the exciting news with special plans this week! Love mussels, and I can’t wait for your book, Mimi! I know what you mean about teenage boys. We were 13 until yesterday, including 4 hungry boys – a typical dinner would be 4 roast chickens, a huge pot of ratatouille, and a kilo of rice! …’la grande cuisine’ …mmm, nice thought, but it feels more like mass catering sometimes! I guess that’s why you write a food blog and I don’t, lol! We’re down to 6 people now, scaling back on portions until the next set of friends arrive. Your recipes are always inspiring. Ah congratulations on your book deal, Mimi. You most definitely deserve it– I guess it was only a matter of time! I am truly excited for next autumn when your book comes out. J’adore this blog. Although I’m not much of a cook anymore, I am a photographer and your photographs are a feast for the eyes. Reading your blog from Ouagadougou, Burkina Faso where I’m spending three months volunteering. One month in and I finally have a good enough internet connection to sit and enjoy it properly. I thought my food envy was bad enough at home in Scotland, but a month of adaptive cooking and a lot of rice, I couldn’t be more jealous. Thanks for providing me with a lovely hour or so of browsing and for inspiring me to to learn to cook when I get home! “I guess when it comes to food, all of us food-obsessed people are kindred spirits.” That was so well written Mimi! Thank you for an amazing collection of recipes yet again! I stopped eating meat years ago, but my days in France were spent seeking out mussels. I loved loved loved eating them with some good table wine and crusty baguettes. Your recipe makes vegetarianism difficult. I love mussels and will be eating them in plentyfold coming week in the South of Spain! Can’t wait for your book to be published! I’m curious to know which cook books are amongst your favourites? The girl’s dress is made of the petals of wild rose, rosa canina. Remarkable colour. Beautiful as always. Your website is such a treasure. Goodness, I love your blog. I look forward to your cook book! Dear Mimi,I was touring the calanques around Marseille and Cassis and only now catch up. Love the mussels pictures (and love mussels too, my strongest mussels-country association being the Prince Edwards Island in Canada). I wish you much success with the book project and look forward to it! I was just looking for a new mussel recipe and found this! It’s beautiful, I love the combination of shellfish and something porcine, they work so well together. I live near a fjord famous for its mussels in Denmark so they are my favourite thing to eat when I can find them. Can’t wait to try this. Congratulations on the book and good luck with all the recipe testing. Coucou Mimi, yet another wonderful recipe that I look forward to trying! I may not comment that much but I just adore your place… You inspire me n encourage me to dream to move to country… An idea I dream about regularly… May be someday! All the best to you… It will be gorgeous ! I absolutely adore mussels. I must try them your way with the sausage and ham. My husband will love it! I always do them with white wine (or champagne), lots of garlic, butter, then a handful of parsley and squeeze of lemon before serving. Your version will be used next time for sure!